On the final season of “The Bionic Woman,” the TV show introduced a bionic German Shepherd named Max. I was such a fan of the show that I named my first pet dog after it, even though it was a basset hound. That innocuous story is more interesting than the entirety of Max, the new canine-centric caper directed by Boaz Yakin, whose Fresh cred ran out a long time ago. Max, a Belgian Malinois trained by the Marines to sniff out armaments in Afghanistan, is flown back to Texas after the death of Kyle Wincott (Robbie Amell), his trusted handler. Justin (Josh Wiggins), Tyler’s moody 14-year-old brother, puts down his video-game controller long enough to adopt the now wayward dog with the help of Carman (Mia Xitlali), his new sassy squeeze from the Latino side of the tracks. Ray (a Thomas Haden Church sighting! ), Justin’s ex-Marine dad, questions keeping Max after Tyler (Luke Kleintank), Kyle’s duplicitous war buddy, fingers Max as a cause of Kyle’s death. Meanwhile, Justin’s mom (a Lauren Graham sighting!) stands around spouting lines like, “This family takes care of its own.” And Carmen’s insufferable brother Chuy (Dejon LaQuake), ostensibly present for comic relief, reels off an endless stream of spanglish slang—”You loco, white boy!”—and unfunny quips about the border patrol. It’s hard to decide where to finally checkout on Max. Maybe it’s late in the film, when Max tracks Ray’s scent across a river and up a wooded mountainous ascent, even though Ray rode up the mountain in a pickup truck on a gravel roadway. For me, it came early on when a Marine honor guard inexplicably drags a yelping Max into the church during Kyle’s funeral, all for the lazy emotional gut-punch of watching Max leap onto the casket. Although set in Texas, Max was filmed in western North Carolina, with such shooting locales as Asheville, Charlotte, Kings Mountain and the town of Faith. The film should deserve merit for incorporating the intersection between white and Mexican cultures common in today’s small-town South. But its leaden, simplistic portrayal rings with the resonance of a tree stump. Consider the film’s head-scratching contradictions before consigning it to the genre of inoffensive family entertainment. It’s is a pro-military film in which the main villains are a felonious, gun-running Marine and his crooked cop partner. It’s a pro-Hispanic film that promotes criminal cartel and dog-fighting stereotypes. 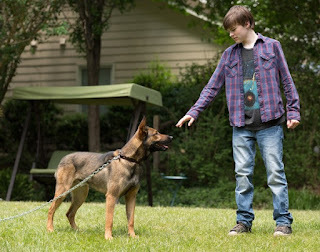 It’s a movie for dog lovers in which dogs brawl on multiple occasions and the (mildly racist) Ray at one point points a gun in Max’s face, intent on shooting it. And it’s a kids movie full of all those things, plus as many firearms, handguns and RPG launchers as American Sniper. Moreover, it’s never a good sign when the best actor in a film is the animal star. Max is a dog, and so is the film.